Philly’s GAYborhood is located in the heart of The Washington West neighborhood of Center City. On 18 April 2007, the city of Philadelphia officially recognized the Gayborhood area by adding 36 gay pride rainbow flag symbols to street signs. 32 additional signs were added in June 2010. 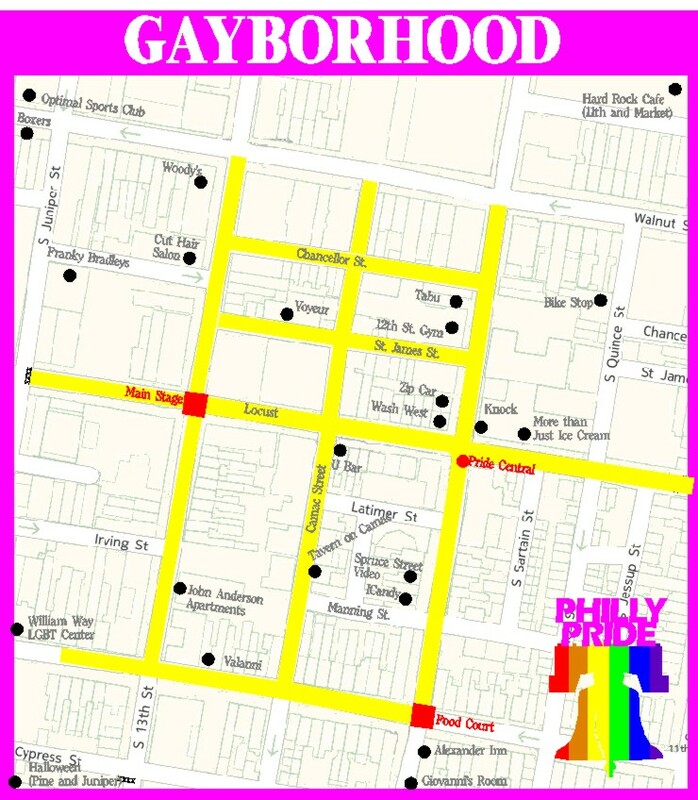 The term “Gayborhood” was first used to describe OutFest by the City Paper, when David Warner described it as a “beautiful day in the gayborhood.” Philly Pride immediately began to use to the term the following year to describe the area of our gay pride parade formation. It has now become a universally recognized term. Philly’s GAYborhood is located just four blocks south of City Hall, and is very convenient to get to using public transportation. If you are within Philadelphia, SEPTA trains and busses stop close to or in the GAYborhood. If you are on the Market-Frankford line just exit at either 111th or 13th street and proceed south. If you are on the Broad Street line just exit at Walnut Street and proceed east. If you’re coming from Southern New Jersey, PATCO stops at 12th/13th and Locust Streets. And if you are in the Pennsylvania suburbs, both Market Street East and Suburban Stations are only a few short blocks away. Driving north, get off at the Washington Ave. exit, make a left onto Columbus Blvd. continue a several lights on Columbus Blvd until you reach Dock Street, make a left on Dock Street follow Dock Street around on the left (on cobblestones) until you reach Spruce Street. Follow Spruce Street until you reach 13th. Make a right, next light is Locust. Driving south, after passing Girard Exit, stay on your left and get off at 2nd Street, continue on 2nd Street until you reach Walnut Street, make a right on Walnut until you 12th, make a left on 12th and the next light will be Locust St. Plenty of off-street parking is available throughout the GAYborhood on normal days, but OutFest is NOT a normal day. Your best alternative is to proceed west on Walnut, make a left on Juniper, and park in the lot to your right. There are several lots on Broad Street which are readily accessible and are only a block away from OutFest.